St. Nick is a 6-year-old male cat whose previous owner became ill and could no longer take care of him. One thing's for sure, St. Nick didn't miss any meals in his previous home! He's a chunky kitty who needs a diet and some exercise in his new home. If you're looking for a pal who is content to sleep the day away while you're at work and snuggle up with you in the evenings, St. Nick would love to be your new friend! Washington Humane Society. For more information about St. Nick, contact Call Natalie Kahla, Adoptions Manager at 202-576-3207 for the DC Shelter (operated by the Washington Humane Society) 1201 New York Avenue location. 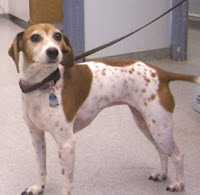 Chanel is an 8-year-old Beagle whose previous owners lost their home and had to move to an apartment that didn't allow pets. Chanel is shy at first, but after you spend some time with her she becomes quite a cuddlebug and loves to snuggle up next to you and roll over for belly rubs. Even though she's an older dog, she still has enough energy to enjoy play time and daily walks. She gets along well with other dogs, but prefers calm dogs. She is not recommended for a home with young children because they would likely stress her out. Chanel is full grown at about 20 pounds. Washington Humane Society. Spanky is a six-year-old male orange tabby who was surrendered because the dog he shared a home with complained about him. I hear that he is anxious to find a home, go meet this handsome kitty today! That is a handsome cat!